Compact Disc (CD) selections from the first releases on the Immortal Performances label. 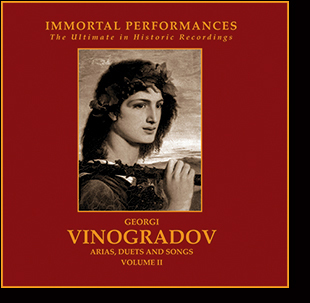 From the Russian Legacy, our second volume of the rare recordings of this great tenor. The acclamation greeting Guild’s first album of this great tenor’s singing has led to this second collection of arias and songs. One of the great voices of the century. "The voice we hear is meltingly beautiful, naturally produced, plangent and plaintive . . . the tenor gives attention to text as if he were living the thoughts for the first time. A voice . . . so beautiful that every note, every intelligently sculptured phrase, is worth hearing – a ravishing singer."